Casio has revealed a new tough watch aimed at water sports enthusiast. The model called Frogman (GF1000BP-1) has an asymmetric design that improves the contact with the wrist and allows additional room for wrist movement during underwater activities and features a deep wave band which allow a comfortable fit over the sleeve of a wetsuit. The new member of “Master of G collection” sports a solid stainless steel case wrapped in resin and a screw-lock case back for better strength and reliability. The Frogman feature Self-Charging and Tough Solar Power Technology which combines solar panel with a large-capacity rechargeable battery and enables a variety of energy-hungry functions to “operate smoothly” by both natural and artificial light, as well reduce the need for battery change. Other features included Full Auto EL backlight, Four Daily Alarms and One Snooze Alarm, World Time, 12/24 Hr Formats and 1/100 Second chronograph. Of course it is 200M scuba diving water resistance, certified by the ISO (International Organization for Standardization). 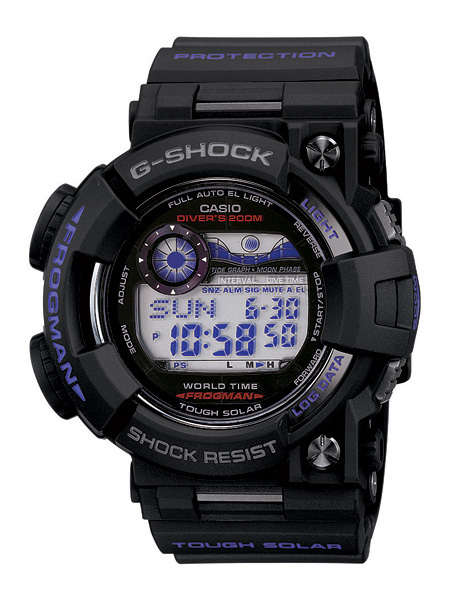 Casio’s new G-Shock Frogman (GF1000BP-1) will be available in April for $675.